We are a London based Hair Surgery Clinic (established 1964 by Dr B Stevens a pioneer of single hair grafting). We specialise in both FUT and FUE hair transplants. In addition we offer beard transplant and eyebrow transplant surgery. Although every procedure is unique most will fall within £2500 – £4500. CQC & TTS (care quality commission & Trichological Society) registered. To view before and after pictures please click here. FUE Hair Transplant – The most up to date method of transplanting hair. The most cost effective method of transplanting the maximum amount of donor hair possible. In addition an FUE hair transplant is mostly undetectable to the naked eye and a shorter recovery time to that of FUT (follicular unit transplant). At the Holborn Clinic we will advise you on the best course of surgery for you to obtain the best results. There are some differences in both FUE and FUT hair transplant. This is important for you to understand so please take a moment to read this page. The primary objective after patient care and safety is that of the best result. In some cases FUT will be the preferred option. Please give us a ring if you would like to speak with one of us who will be glad to answer any of your question. So what is the difference between FUE (follicular unit extraction) and FUT (follicular unit transplantation)? In summary, in a FUE hair transplant individual grafts are taken from the donor site. In an FUT hair transplant, a thin strip of skin is taken from the donor site. Our specialists can discuss the procedure, your medical history and suitability and of course the price structure. We can discuss the most appropriate technique to suit you. Most of all taking into account your requirements. Our consultation are offered free of charge. Most will take around 30 minutes. You are welcome to give us a call and speak with one of us prior to arranging a consultation. We are happy to a answer any questions that you have. Please note we will be unable to give an accurate price however, if you were to send some images this may assist. The best option is to arrange a consultation at the clinic. The required coverage will be drawn on the scalp. The hair will be shaved where required. A Local anaesthetic is administered. Follicular units are taken from the donor site. The patient remains awake throughout the FUE procedure. Finally the units are transplanted to the required site while the patient is awake. Most noteworthy is that of the experience and expertise of the surgeon when ensuring a natural look. 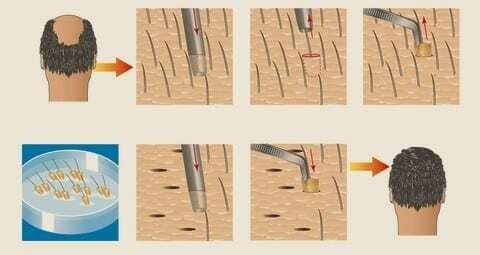 The angles of hair growth, in addition density, donor hair suitability and especially relevant patients requirements. The hair when transplanted must feel and grow like normal. Follicular unit transplantation refers to a surgical technique where upon units of 1-4 hairs (follicular units) are transplanted from one location (donor site) to where required. The unit itself contains nerves, a sebaceous gland, the arrector pili muscle, dermal papilla and in some cases a vellus hair. Transferring in such units will allow such numbers in the low thousands to be transferred in a single session. Once the strip has been taken from the donor site, stereo-microscopic dissection takes place. This will ensure the maximum amount of successful grafts are taken which limits the possibility of damaging the units. It should be noted that size of units varies from patient to patient. Care should be taken to make sure the unit size is the same as that of surrounding hair. Taking such small units will of course add to the over all natural look. Dissection will trim each unit to allow this to be placed within its new recipient site reducing trauma to connective tissue and blood supply. This in turn will minimize trauma to the patient and reduce any possible scaring. The new site evolves through an incision created by the surgeon. The incisions are small and needle like thus promoting a snug fit which will encourage stability and rapid healing. Strip grafting (FUT) will take longer to heal compared to that of FUE. In addition there will be a scar that will remain. However, surrounding hair will mask any scar tissue adequately. Whether to choose FUT (follicular Unit Transplantation) or FUE (Follicular Unit Extraction) will be a discussion with the surgeon. Finally our aftercare service at the Holborn Clinic is especially relevant to assist prompt recovery. Medication is given in addition to promote the best possible recovery. The most up to date method of transplanting hair. Probably the most cost effective method of transplanting the maximum amount of donor hair possible. In addition an FUE hair transplants is mostly undetectable to the naked eye. In addition the shorter recovery time to that of the FUT (follicular unit transplant). We conduct all our procedures at our clinic. There are no salesman, only highly qualified trichologists and surgical staff who work at the clinic. We are located a short distance from the famous Harley Street in the vibrant Holborn region of London. The difference is that you will not be paying huge Harley Street prices. When conducting a surgical procedure you will be the only patient on site. Our clinic has a warm, inviting but clinical theme designed to make the patient feel as comfortable as possible. At consultation we will invite you to view the theatre and fully explain the complete procedure. Most importantly you will meet the surgeon who will conduct the procedure. Finally in conclusion this is a life changing experience for most patients. We will make sure that every FUE hair transplant or FUT hair transplant is completed on suitable patients. In addition by the best hair restoration surgeons and technicians.